Brian Sanders, a long-time member of Momix, built his signature style by creating off-the-wall choreography with found objects and other discarded debris giving way to the troupe's name, JUNK. "I like to find the dance inside these pieces of junk; something unique and unexpected that gives us [the audience] a new and inspiring look on life," says Sanders. The troupe's shows are an exhilarating feast of exciting physicality and creativity, elegantly served up with beauty and wit. Plunge into the fantastical imagination of the innovative Artistic Director Brian Sanders for a raucous ride through the machinations of found objects turned spectacle. 'Renowned for its thrilling moves' and unique fusion of aerial choreography and props, Sanders and his troupe JUNK build a world of wonder out of things you pass by everyday. 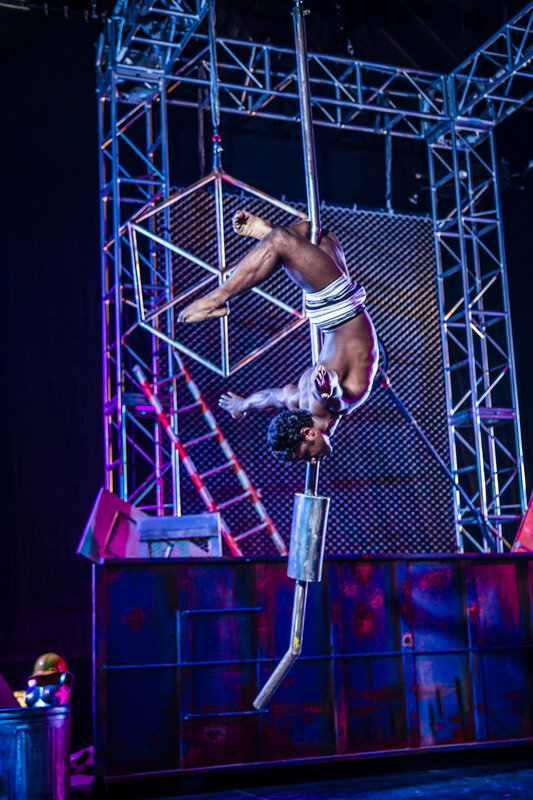 Let yourself be immersed in a fantasia of acrobatics, athleticism, dance and theater. URBAN SCUBA is JUNK unparalleled and you'll never look at objects the same way again! For Booking Inquiries or more information please fill out the form below!